Located on the south of Yunnan Ailao Mountain, 300km from Kunming, Yuanyang rice terraces cover an area of 170,000 acres.It is the world's largest and most spectacular rice terraces.This masterpiece creatived by Hani people for generations.Since 1000 yeas ago,Hani people has began to craft out the Yuanyang rice terraces by their bare hands.With generations’ efforts,the rice terrace has been in large scale and still in using.It has been one of the famous scenic spots of Yunnan. The best time to shooting the terraces is from November to next April.The most beautiful time of Yuanyang rice terraces is from January to February when the amazing clouds sea may appear after Spring festival. There are directly express buses from Kunming to Yuanyang Xinjiezhen every day which takes about 6-7 hours. 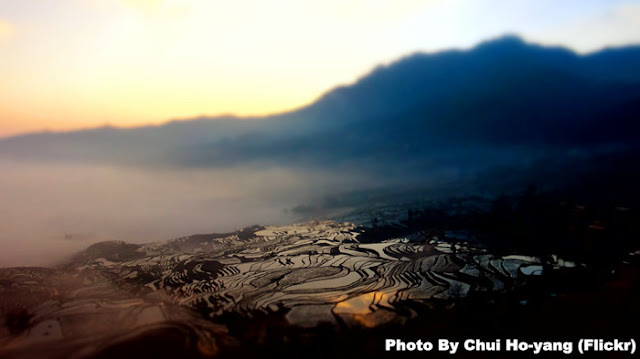 After arriving the Yuanyang Rice Terraces,you have variety of ways to rice terraces like taking charter vehicle or public transport, or minibus, or van.